I once was given some homemade bath fizzies as a gift - and I loved them! But I wondered how to make them? Now I can! All it takes is a little mixing, some gradual spritzing, and a few minutes of molding. When you're finished, you'll have dozens of effervescent treats in a variety of shapes and colors to scent and soften your bath water as they bubble. Perfect for presents - just put them in mason jars! Or stuff stockings with cellophane bags filled with colorful Bath Fizzies. 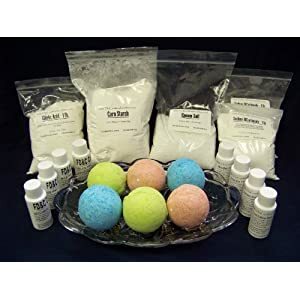 -- This is everything you need to begin making your own highly scented quality Bath Bombs! !